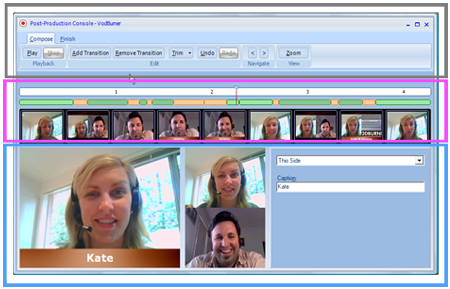 Using the Post-Production Console Menu - Record Skype Video Calls Free with VodBurner! 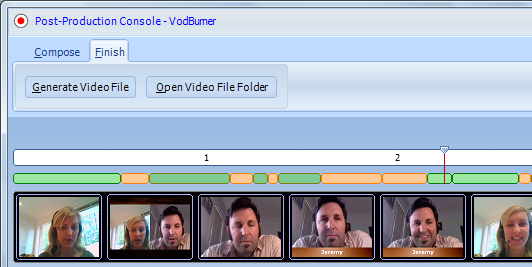 VodBurner has a powerful Post-Production Console where you can edit the Skype video conversations that you have recorded with VodBurner. In this article, we are focusing on the Post-Production Console Menu (the area in the grey rectangle). Zoom – Zoom in on the timeline to edit more precisely. < – Move the timeline stylus back one frame. > – Move the timeline stylus forward one frame. Add Transition – Add a transition to the timeline, so that you can alter the way the picture appears for a portion of the video. The transition is added at the current stylus position. NOTE: On the first edit, VodBurner automatically adds transitions based on who is talking at particular points in time. Remove Transition – Remove a transition that you previously added to the timeline. NOTE: This does not remove the actual content – if you want to do that, change the segment type to “Skip”. Undo – Undo the last change you made. You can undo multiple changes, right back to your first change. Use Ctrl+Z on the keyboard as a shortcut. Redo – Redo the last undo. You can redo multiple times. Use Ctrl+Y on the keyboard as a shortcut. Play – Play the video, starting from the timeline stylus position. Use F1 on the keyboard as a shortcut. Stop – Stop playing the video. Use F2 on the keyboard as a shortcut. Generate Video File – Create an ASF file (equivalent to a WMV file), suitable for publishing, for example by uploading to YouTube. Open Video File Folder – Open the folder containing the ASF file and other project files. To review the finished video in your favourite player, click this button then double-click the file “Generated Video.ASF”. Continue on to the next article in this series: Using the Post-Production Console’s Transition Control. Jump ahead to Using the Post-Production Console’s Playback Control. The post-production console will start. Click “Clear All Transitions”, then select “Other Side” in the panel on the right-hand side. A video file will be generated that contains the other side video, together with both sides audio. I would like to have combined (both sides) sound on the other side video. How?